Now a days millions of websites are live and made for mobile or desktop users. So Layout on your iPhone, iPad quite different, Sometimes you can see or access your website on desktop view effectively, but not on Mobile view. here I explained how to Open mobile website in Desktop view on iPhone. Like online applications websites, money transfer, here is the great and secure way to do all things for any website in desktop look. Without use of any third party apps, Plugins, Extensions. in most cases website developers are using third party online services to view own web design on different devices: Mobile, Desktop/ Mac, iPad/ Tablets. Here I gave steps for Open any website to desktop view for Google Chrome, Safari. Useful: Alternate Web Browser for iPhone, iPad. Step 1: Open Website on Google Chrome or Safari. Now all the content and images set on mobile view for batter user’s experience on small screen device. in that case some website not compatible with mobile view, and not showing correct format. 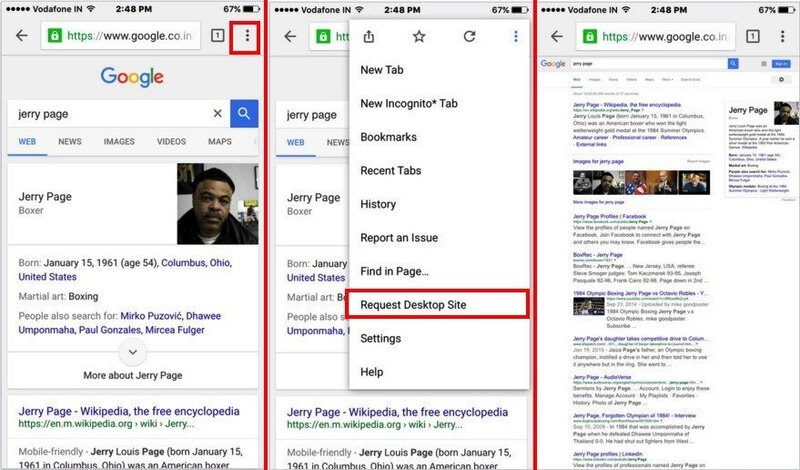 Step 2: Here I open google.com and search Jerry Page. Now we can see full biography in to mobile view. Bot not easily. For Chrome: Search any thinks like “Jerry Page“, From the top three dotted menu icon, Tap on it. Then Tap on “Request Desktop Site“. Now, Wonderful you can see full page in to clean interface: Desktop view. 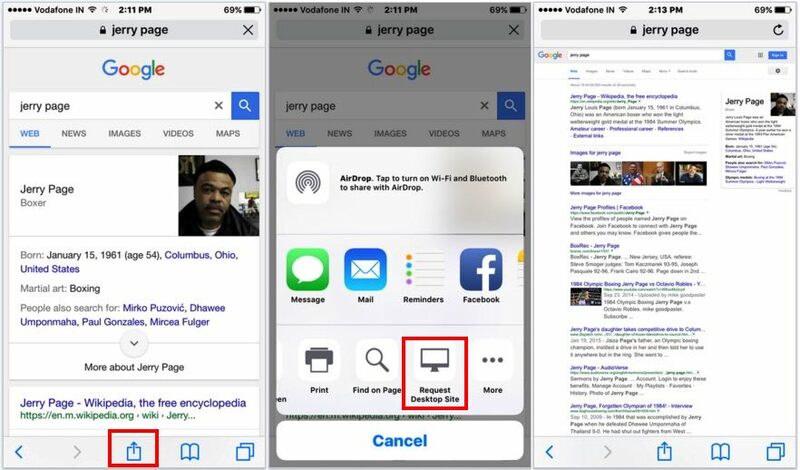 For Safari: Same for Safari also but find whatever you want, Tap on more option icon from bottom tab, Scroll right under menu and Tap on Request Desktop site. Note: in the case you can’t get effect or not able to convert into desktop view then you can’t do, Because this side only made for mobile users or developer disabled that features on backend. Further query on Open mobile website in Desktop view on iPhone , iPad or iPod Touch Safari or google chrome web browser. Share with us.